Displayed year-round on walls of curling rink. One wallboard design can be reused year after year. Wallboard size is 3' w x 2' h.
$200 per year + GST, plus set-up fee for producing your wallboard. Prominent locations in the curling ice . Displayed from October to March. Large: 8ʼw x 4ʼh; located at centre ice. $225 per location, per year. Medium: 3’w x 2’; locations include hogline, backline and house corners. $200 per location, per year. Small: 20” in diameter; locations include house button and various other small locations on the ice. $175 per location, per year. All rates are subject to GST and a set-up fee for producing your mesh ice logo. Mesh ice logos can be reused year after year. An online ad, prominently placed on each page of our website. Add website advertising to your in-ice logo or wallboard ad: $50 per year. Online ad only: $100 per year. Minimum size 150w x 100h pixels. Donations in support of special events such as monthly draws, bonspiels and competitive events. Excellent marketing opportunity for local business. Sponsorships can be in the form of cash donations, gift certificates, discounts or merchandise, at your discretion. Includes your logo prominently displayed on our website, with a link to your website. 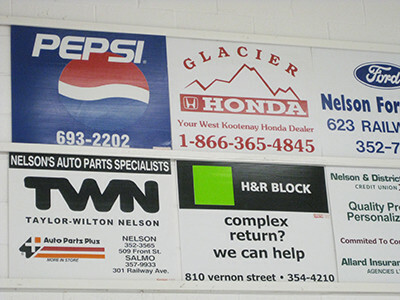 Upon payment of the advertising fee invoice, the Nelson Curling Club agrees to provide the chosen form(s) of advertisement. The advertising agreement is renewed annually by both parties of the agreement. Remove the advertisement for non-payment. Determine advertisement locations, based on size, colour, quality and long term commitment of advertiser. Refuse poor quality wallboards or ice logos provided by the advertiser. For Wallboards: Within 30 days of invoice. For Ice Logos: Before October 6, when the ice goes in at the rink. Download and print our advertising agreement (PDF, 150KB). Return the completed agreement, with payment, to the curling rink.